Travel advice for Damascus is constantly changing due to current events. Keep updated with the latest Syria travel advice. Until 2011, Damascus was one of the jewels of the Middle East, a city famous for friendly locals, mediaeval architecture and a straggle of bazaars that could have sprung fully formed from the pages of Arabian Nights. Now, however, things are very different. While much of central Damascus remains unaffected, the suburbs are the sight of an ongoing battle of attrition between government forces and rebels of varying ideologies. Outside the city, Syria is blighted by one of the bloodiest civil wars of modern times as well as an Islamist insurgency led by the brutal jihadis of ISIS. That such a state of affairs exists is made even more tragic by the fact that, in its pre-war days, Damascus was being described as ‘the new Marrakesh’ thanks to its atmospheric alleys and the centuries of history. Founded between 10,000 and 8,000 B.C, the Syrian capital is the oldest continuously inhabited city on the planet with the Umayyads, the Romans, Mamluks and Ottomans among those to pass through. Traces of their rule can still be seen in the magnificent Azzam Palace, the hulking, fortified Citadel and the Mausoleum of Salah al-Din – the Mamluk leader better known in the West as Saladin. 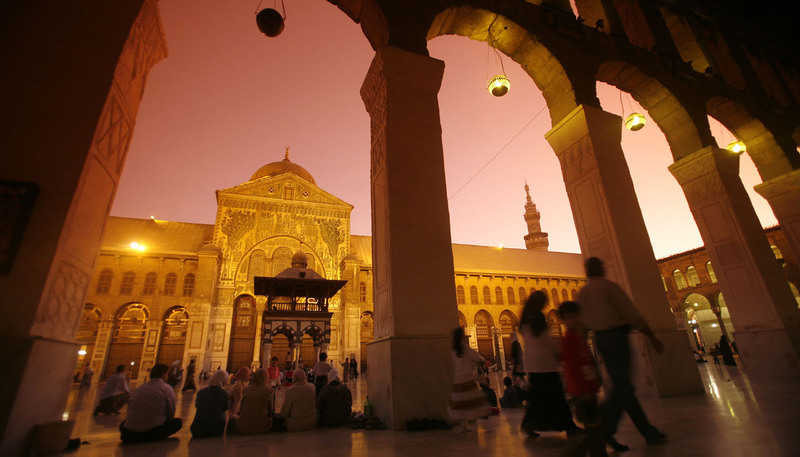 But nowhere is this multi-layered history more apparent than in the Umayyad Mosque, which is considered the fourth-holiest place in the world for Muslims but has been alternatively an Assyrian temple, a monument to Jupiter and a Christian church. Modern Damascus has much to recommend it too, not least in the bazaars, Souq al-Hamidiyya in particular, that spread through the city’s winding streets. Although there’s little in the way of alcohol, the area also boasts convivial cafés that serve sweet tea and even sweeter baklava pastries as well as a dose of local gossip. These simple pleasures, along with the chance to see magnificent palaces and monuments, once made Damascus one of the loveliest cities in the Middle East. Here’s to hoping it will again when the fighting stops.